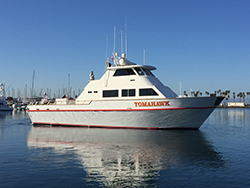 Captain Jeff Spafford from Tomahawk Sportfishing out of Seaforth Landing checked in with a wrap up report for their 1.5 day charter with Socal sportfiishing Club. We managed to land 4 Yellowtail but sea lions and a rocky bottom got the best of us. We did get 125 Reds, 65 assorted rockfish, 40 Bonita, and 10 Whitefish. Pretty good weather, but the wind came up on us a little bit. Great middle of winter fishing. If you want to get on one of these trips check us out online or call Seaforth Landing.